Well it was a long time coming, but so glad I was able to finally get Lauren Bushnell on the podcast. 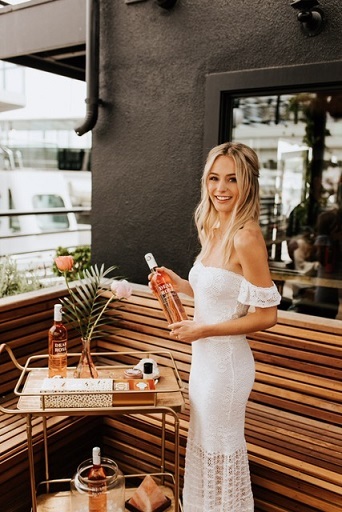 Started the conversation with her about six months ago, we always wanted to do it around the launch of her wine, but it kept getting pushed back, and I know Lauren was always a little skeptical in regards to speaking about Ben and their relationship. She’s moved on, she’s had a boyfriend for a year now, and she knows anything she says about her past relationship can get taken out of context, misconstrued, etc. But she was honest about her thoughts on him telling both her and JoJo he loved them, their break up, the “Happily Ever After” show, and Ben’s podcast. I think she was very respectful of their relationship, but I get that it’s tough to talk about when it was over a year ago and you’re in a new relationship. So I thank Lauren again for opening herself up and being candid about how she felt at the time. I think you’re really going to enjoy this one. Right at the top of the interview, I let you know how Lauren is contributing to Friday night’s party. As always, if you want to respond to the interview, please include Lauren’s Twitter handle (@LaurenBushnell3) in your replies so she can see them. Enjoy these 90 minutes with Lauren Bushnell. No “Dr. Reality Steve” today only because I got bogged down with stuff the last 24 hours in regards to the Fan Appreciation Party tomorrow night in Vegas, so they will be carried over into next week. We’ve currently got four so that’s good. In regards to the party, you can follow along on Periscope tomorrow night around 9:15-9:30pm PST for the trivia contest. Should be a good time as it’s been for the first 4 years. Unfortunately, there are no spots available and this is expected to be the biggest turnout I’ve ever had. I will see with this many people if it’s possible to fit more in that room and keep it in mind for next year. I’ll be updating my Twitter and Instagram with pictures from the weekend if you want to check those out. Lucky enough to get hooked up with tickets to Game 5 of the Stanley Cup Finals tonight for the game, so I’m taking my niece Olivia. Even though she’s a ridiculously obsessed Anaheim Ducks fan, there’s no way I couldn’t take her to this one. She’ll be rocking her brother’s Marc Andre Fleury jersey as we both would like to see the Golden Knights win. Can’t wait. For the love of all things holy RS, please either learn proper grammar or get an editor. “Why her and Ben broke up”, it is “Why SHE and Ben broke up” and that is just one example of many, many bad grammar usages by you. I’m not perfect and most are not, but your errors are so egregious it is painful to read. Tip – Take the other person out of the sentence and if it still works it is correct. Why her broke up, would not work. Why she broke up would. Very, very simple rule use, it in the future. You’re a professional (using that term loosely for obvious reasons) writer for Christ’s sake. I was typing fast and left out or used improper punctuation which is funny considering the post. However, I am not a professional writer so you have that. Ugh. It would have been good if there were a few less “like”s from Lauren and a little more transparency. Steve: What was the main reason your relationship with Ben broke up? Lauren: We weren’t compatible. ? I looked at her IG account. Are there really that many people interested in the pin-up photos of her in a bikini? Okay. Maybe this whole bachelor/bachelorette thing isn’t for me. Still enjoy your posts, Steve. I agree with the too many ‘like’ thing throughout the podcast. Urgh! She didn’t go into too much detail about her break-up with Ben, but then again I don’t blame her. For one, she’s entitled to keep that private; it’s not really anyone else’s business. He has touched on this in the past. He’s not a grammar wizard. The best part is that he doesn’t care. I am grammar-OCD so I had to make a choice: leave the site or enjoy the read. I enjoy the read. Hope you do the same! @jlal If you are going to correct someone for grammatical errors, make sure there are no errors in your own writing! You made mistakes too. Your use of parenthesis was incorrect. It should have flowed like a regular sentence and it did not. upmyalley – I addressed and acknowledged my errors in my second post. This site does not allow one to edit something after posting. I also made the point that most including me are not perfect. The difference is RS writes for a living, I do not. You don’t have to be a grammar wizard to know which pronoun to use, it is not some obscure grammar rule. Lauren is one of my favs but her constant well, like I was uncertain like, I try to stay like true to like kinda myself. Like I didn’t know what to like kinda like think because like I am kinda a shy person. Whoa…I would be rich if I got paid a dime for her fillers when trying to string a sentence together. I’m still anxious to try her wine… sounds delicious. So, what bothered me about this podcast… one of the few I’ve listened to… is that when RS started talking to Lauren about her reality show with Ben, they rightly talked about the awkward dinner with Jojo and Jordan. But, that’s it. RS even brought up the fact that Lauren got a bad edit… which was a big deal… and Lauren started to jump in to answer, seeming eager to address the topic…. and RS cut her off and started talking about her new boyfriend. Wah-waaaaaaah. Yeah, let’s not talk about interesting stuff. Let’s talk about her knew boyfriend who nobody knows or cares about. In that show, Lauren got a horrible “edit”. She came across as entitled, high maintenance and self absorbed. I really wanted her to address that. It was completely different than her Bachelor edit, in which she came across as quiet and unasssuming. That was a BIG whiff by RS. The other thing he should have covered from that show was when Ben called off the engagement. That was kind of a big deal. I know RS didn’t watch it, but he should have known enough to ask about these things. It’s not like he’s trying to keep some to some kind of time frame on these podcasts & had to move things along. They are extremely long. And when he even brings up the edit, only to cut her off and talk about something nobody cares about. Wow. RS, you need to sometimes be quiet and let people talk. We’re there to listen to them, not listen to you blather on and on about your Bachelor knowledge. Let her talk. Very poor interview. I enjoyed listening to Lauren, but RS kinda ruined it for me. @rob, I totally agree about Lauren being unassuming and quiet. I had no idea that she got a bad edit (I’ve not seen or heard her post show to see how different she was), and the other show hasn’t aired in the UK. I wonder why they gave her such a bad edit ?! I felt sorry for her when Ben told her about JoJo, and that he said he loved her too, just so horrible for Lauren to hear that. I’m surprised she didn’t want to call off her engagement, I wouldn’t have respected him for doing that, if it was me. Lauren most definitely comes off as the better person. It seems Ben was the one wanting fame, and Lauren just wanted a normal life when she could get it. @tinyred: there are only two possible reasons for a bad edit. First, they may have wanted to create drama (of course). And second, that’s the way Lauren really is, and she got the “good” edit on The Bachelor because she won. The thing that always comes up with these things is that the person in question DID say the things they show (except in the case of franken-byting). Trying to recall, but Lauren did mention in the podcast that she decorated their house cute & she only took certain items that she purchased. Problem is, it came across in the show like she did a major, expensive redecoration of the house that Ben wasn’t in agreement with. It’s not clear to me whether she was really spending HER money, or whether it was BOTH of their money being spent. If the latter, then Lauren had no business removing everything she purchased when she moved out. It was the same with the wedding. Lauren was going for an elaborate wedding that Ben didn’t want. This was one of the themes of the edit. Lauren was going BIG with the things she was doing and Ben thought she was going too big & couldn’t afford it. The sense was that Lauren was spoiled and didn’t even think anything she was doing was wrong. She still doesn’t. The sub-text may have been that she was running up the credit cards trying to make everything look good. That’s kind of the spoiled/entitled edit I’m talking about. It’s been too long since the show, but there were a lot of things that occurred every episode where they butted heads. I think Ben finally got to the point where he couldn’t deal with it anymore & then called off the engagement. Ben had his issues too, but that was the narrative nonetheless. Great podcast. The most memorable takeaway was Steve’s repeated doubt that the wine will show up? Lauren got a bad edit? How?! We all enjoyed her on Ben’s season. There wasn’t any drama with Lauren. She seemed nice enough. It’s the words that are coming out of her own mouth now that are turning the tide. Ben’s still upset about their breakup and she’s calling him a “disaster”. What a b/witch! @corn, I asked the same question about Lauren’s bad edit. See Rob’s reply to me. Arh! I see what you mean now. I agree, you never know whether they do it for drama or part of it too is due to franken-byting. I’ll have to look out for their after story. We’re just finishing up on JoJo’s season overhere, and I have a feeling they are just going to go straight to paradise season 3, rather than show Lauren and Ben’s after show. @jlal I know what you mean. I try to write correctly and it’s frustrating not being able to edit or delete. Steve really should have an editor but then he would probably have to pay for that luxery.Might put too much of a dent in his travel budget lol!